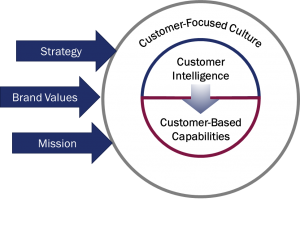 How do Temkin Customer Experience finalists Bombadier Aircrafts, Citrix, Fidelity, Oracle and Blue Cross Blue Shield of Michigan create the Customer Intelligence that feeds their customer experience programs? The first stage of creating a world-class customer experience is Customer Intelligence – a 360 degree view that brings your customers to life for employees from front-line staff to executives. I outlined some ways to build Customer Intelligence in this post. I recently ran across a gold mine of examples, courtesy of the Temkin Group. On Customer Experience Day they offered for free the submissions of their 11 finalists for their 2012 Customer Experience Excellence Award. Most of the submissions focus on results instead of process. But even so there were many nuggets that can inspire us. This will be the first of two Customer Intelligence posts. This article is about how they bring customers to life – the next will be how they identify and manage the Metrics that Matter. I’ll walk through highlights, saving my favorite for last. Great executives go on customer visits regularly. Average executives are “too busy” to leave the office. To make sure that customers are a priority, Bombadier created a program to regularly send executives on customer visits. The goal is to help executives better understand customer needs, as well as to learn how their work directly impacts their customers’ success. Their program has sent 50 leaders on 75 customer visits in the last year. Even better, the leaders receive even more context when they interview a customer-facing employee to prepare for the visits. They do not have a structured agenda, but instead focus on active listening. This is different from Tekserve, who uses a structured interview for their visits, but it can definitely work with the right preparation. Customer visits are a terrific way to bring your customers to life. Bombadier’s program ensures their executives aren’t “too busy” to learn about customers. Citrix focused on direct customer feedback to create their Customer Intelligence. Their Bay Area Customer Council is an in-person customer panel that teaches them about local customers and their needs and provides direct feedback on the company’s direction. They use these meetings to create videos about customer needs and product directions that they share directly with their engineers. They also use Customer Advisory boards built around specific customer needs to guide their product development through direct voice of the customer. Another approach is to create a digital customer experience room. A customer experience room is a specific space where you can learn more about your customers’ journeys and needs. As a tech company, Citrix made their customer experience room virtual. This allows their employees throughout the world to “visit” their customer experience room. I’m not the biggest fan of virtualizing your customer experience room. Maybe it’s because I’m old (at least my daughter says so), but I prefer a physical space where you can engage more of your senses. On the other hand, this is the only way to create a consistent experience for a worldwide population. Fidelity only shared teasers of their Customer Intelligence approach, which was too bad. They reference “immersive roadshows” to share their voice of the customer, and created an internal customer experience brand for communicating their message – a fabulous idea. They also referenced frequent communications about the current state of their customer experience. Each quarterly business summary includes customer experience headlines and improvement stories. They also feature customer information in their Daily Huddle Meetings, with managers sharing information on one of their customer experience principles. Oracle made a very visible commitment to customers when they created the “Chief Customer Advocate” role on their board. In addition, Executive Committee members meet customers on a weekly – you read that right, weekly – basis to reinforce their external focus. They add to their external knowledge with multiple customer panels, which give further opportunities for executives to meet with customers regularly. Oracle’s advice to other companies includes “Get directly involved with your biggest customers…. The first-hand anecdotes mean everything.” Oracle does not leave their Customer Intelligence to chance. They take the time to build the first-hand experience into their programs to ensure a customer focus. This is my favorite. Early in their journey, BCBS wanted a way to bring their customers to life for their employees. They knew that not all employees could visit customers, but they also wanted to share the customer experience journey with every employee. They started with an education program called E4, which stands for “Educate, Equip and Empower Employees.” The goal is to teach all employees to view their work from their customers’ eyes. Their first module was “Houston, we have a problem.” In this module they outline their customer experience strategy and introduce their three personas Mike, Grace and Lisa. It addressed key points of who their customers are, their unmet needs, why customer experience is important and what they’re doing about it. Their second module was a mobile 20’x15’ customer experience room. You can learn more about it at http://www.customerexperienceinsight.com/if-the-customer-experience-wont-come-to-your-employees-take-it-to-them/. BCBS used this customer experience room to show how each persona experiences their insurance very differently. 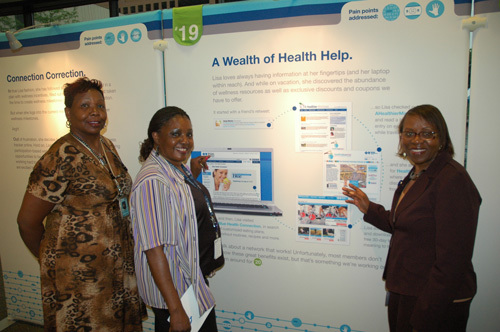 They created a structured two-hour journey through the customer experience room, showing how personas Mike, Grace and Lisa manage their care. Attendees finished by signing a banner to signify their Customer Commitment. The room even won a 2013 Customer Experience Excellence award. This is a great example. Customer Experience Rooms don’t receive a lot of press, but they’re a great way to reinforce to your employees what’s important to your customers. Great companies realize that you need to go beyond surveys to create Customer Intelligence. Personal experience is key to make sure to ground executives in your customer needs, and multi-dimensional learning help for those who can’t talk to customers every day.